Over-upholstered chairs, each with a steeply reclined back, down curved arms and four tapered tinted wooden legs. Measure: Seat height 16". Over-upholstered wingback armchairs of generous size, the seats feature a loose cushions, the legs are newly painted black. Measures: Seat height 17" Arm height 22.5". Pair of over-upholstered armchairs of generous size, raised on four tapered brass feet ending in brass balls. Measures: Height back 36” arms 25” seat 16” Width 35”, depth 32”. 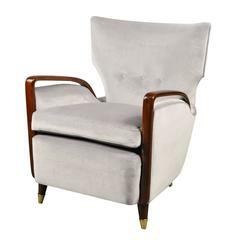 Wingback over-upholstered armchair with wooden front supports which turn into down-curved armrests. The feet feature brass sabots. OUR REFERENCE N9997. 1950s Italian pair of armchairs attributed to Cassina. 1950s Italian pair of armchairs. Pair of Italian armchairs midcentury Italian design 1950s, upholstered in brown wool, brass feet.